As far as embroidery styles go, cross stitch would probably have to be one of the easiest ones to master. It’s easy to produce an embroidered work of art with only the knowledge of one or two key stitches- cross stitch and/or backstitch- and best of all, it’s easy enough that you can teach yourself how to do it. There are a huge variety of kits and charts available to purchase through craft shops and online, which cater to a wide range of tastes and interests, and come in varying degrees of difficulty. If you wanted to cross stitch a teddy bear picture for a newborn child, for example, you are sure to find the perfect design from the hundreds available to choose from both in stores and online. There are also plenty of cross stitching magazines that are published monthly and are full of charted designs which you can use to create cross stitch masterpieces. Time: This depends on the size and difficulty of the design. Some designs can be completed in a couple of hours, while some may take months to finish. Photocopy of a chart/ design to work from (It’s best to make a photocopy so that you can mark the copy and not damage the actual chart- you may want to reuse it one day). 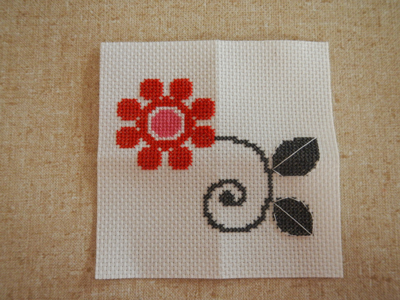 When cross stitching for the first time, it’s best to start with a small design that has few colour changes. 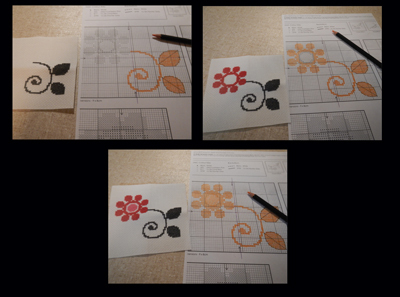 Not only is it easier to do, but it will be faster to complete than a larger design, which can be a great motivator for a beginner. Start by grabbing the chart of the design you have chosen. There should be some arrows on the side of the chart that are not actually part of the design. Using a ruler, draw lines across the design, connecting the arrows. You should have a plus sign now drawn across your chart- the point where the lines intersect is the centre of your design. If you are working from a design that came in a kit, your fabric should already be cut to size. If you are working from a chart that wasn’t part of a kit (it comes from a magazine, for example, or you bought it separately) you will have to buy some fabric and cut it to size yourself. For the design I have chosen, I had to cut my own aida. Mark out the design size using some dressmaking pins and add at least 5 centimetres to each end, to ensure that your design doesn’t run over the edge of the fabric. The chart should tell you exactly how big the finished design will be. Cut the fabric to size. 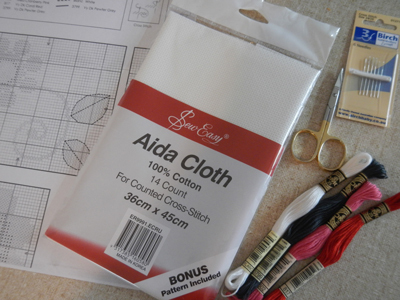 (Note: Aida fabric comes in several different sizes- 14 count is generally the norm, but it can also come in larger and smaller counts, and this will affect the design size. For example, if you do a design on 14 count aida, it will be much larger than if you do the same design on 16 or 18 count aida. The same applies to other fabrics such as evenweave. If you are unsure about sizing, there are plenty of helpful websites that you can go to for help). Find the centre of your fabric by folding it in half, and then into quarters. The centre should be visible in the creases when you unfold the aida. Mark it using dressmaking pins. 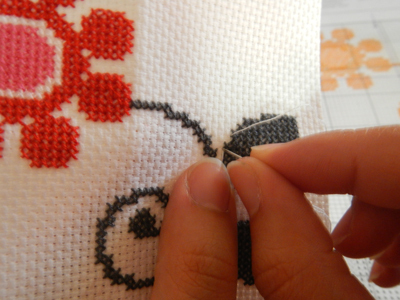 As a rule, you usually begin cross stitching from the centre of the design. Take a look at the chart. You will see that each box has one symbol or colour in it. Each box represents one cross stitch. The key on the side will tell you which colour you have to use in that box. The most common embroidery thread brands are DMC and Anchor, so if you’re working from a chart that wasn’t part of a kit, these are most likely the thread brands that you will need to buy to complete the design. You may also have backstitch in your design. 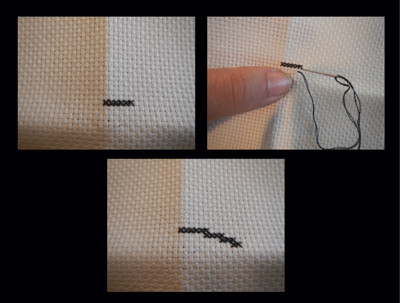 This easy stitch is used to give a neat outline and add details, but will be explained later. 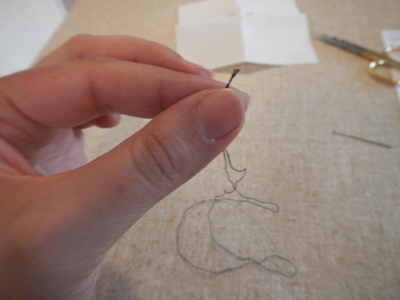 To start stitching, cut a long piece of thread (about 40cm is fine) in the colour that you need. Remember that you are starting from the centre of your chart. Embroidery thread usually has six strands, but most cross stitch designs only need two strands. Separate one strand from the six. 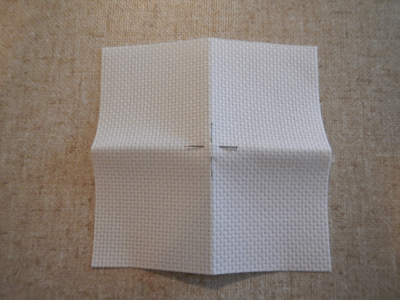 Fold this in half, to create a loop, and thread the two ends through your needle. Find the centre of the design on both your chart and your aida. 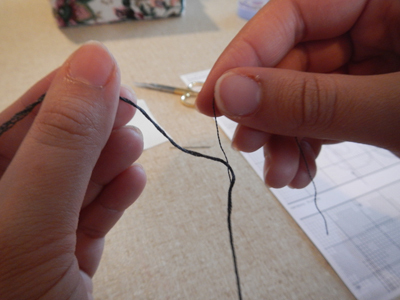 Bring the needle up through the back of your fabric, leaving a small loop of thread on the reverse. 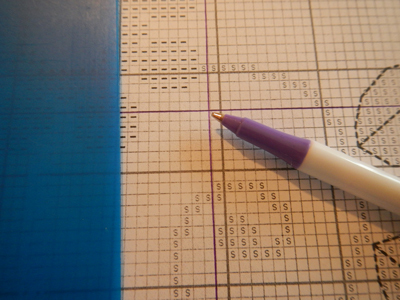 Make a half cross stitch across a single aida block by putting the needle back through on a diagonal, remembering that one box on the chart is equal to one cross stitch on the aida. 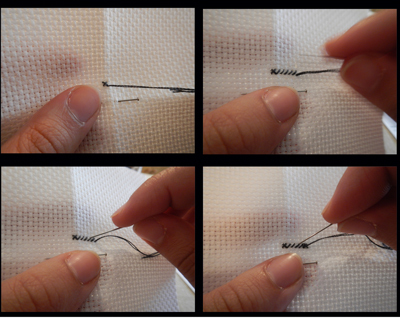 On the reverse side of the fabric, make sure that the needle comes back up through the loop. Pull the thread through all the way so that it is secured at the back of the fabric. This is called a loop knot, and is the easiest and neatest way to begin when cross stitching a design using two strands of thread. 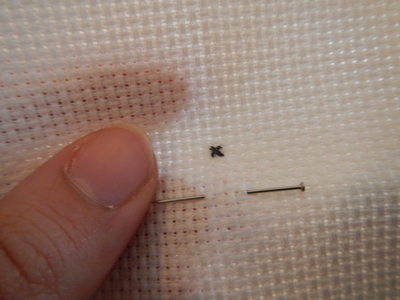 Bring the needle back up through the aida and make a second diagonal stitch to complete the first cross stitch. If you want, you can do each cross stitch individually or you can do a row of half cross stitches and then come back to complete that row. Most people tend to do a row as it is easier to count the stitches and it feels as though you are completing the design faster. Whatever you decide to do, just make sure that all of your stitches run in the same direction, with all the diagonals going the same way, otherwise your design will look uneven and untidy. As you stitch each square, mark it off on your chart using a highlighter or a coloured pencil, so that you can keep track of where you are up to. To finish with a colour, or to end a thread that has almost run out, simply run it through some of the stitches at the back of your work, making sure not to go through onto the design side of the aida. Backstitch is the other main stitch used when cross stitching, and is usually worked in one thread to add detail to the design. It is usually represented on the chart with a solid or dotted line, and is done after all of the cross stitch is complete. 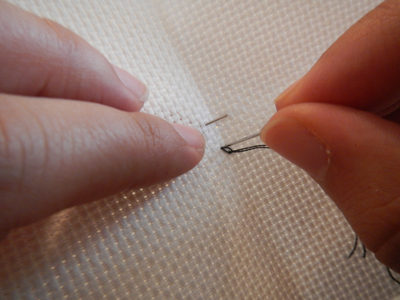 To do backstitch, separate a strand from the embroidery thread and thread it through the needle. Run the needle through the back of some of the cross stitch to secure it, and then bring the needle up through the fabric to the front of the design. 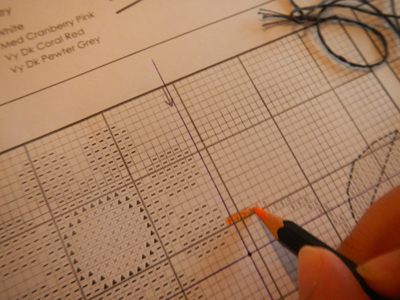 Backstitch is basically a straight stitch, where, following the lines on the chart closely, you follow the lines around your design, usually keeping the stitch lengths to between one and three squares long. There are some other fairly common stitches which appear when cross stitching- such as French knots and fractional stitches- but you probably won’t have to worry about those until you begin to stitch more complicated designs. And don't worry if you make mistakes, or if the back of your work looks messy, because you'll definitely improve over time if you keep at it!